This isn’t exactly related to iOS, but a friend of mine who used to work at Microsoft actually told me that the MS Office Suite for Mac was a superior product to the Office Suite for Windows, according to their in-house Office Suite team!!! MS used to develop the Mac version first and trial ideas there. Not sure if it’s still that way. It’s improved a lot of late but I still prefer not to use it. Steve Jobs knew he’d need strong software partners in order to get Mac off the ground. He convinced Bill Gates to develop Word specifically for Mac’s revolutionary GUI because DOS Word couldn’t handle typography and graphics that Mac was created to do. This happened not long after Gates got blindsided by VisiCalc, which helped sell a lot of Apple IIs to small and large businesses. Legend has it that Gates thought the market for Macs would be professional, niche and small and would never come close to making much of a dent in what was then an exploding market dominated by IBM DOS PCs. It wasn’t until Windows 3.1 that MS was able to run a just about comparable version of GUI Word. I worked on IBM and other hardware and software accounts back in my ad sales days. Unfortunately, never directly on Apple since they and their agencies were on the West Coast. That team, the Office for Mac team, I never read a profile of or heard their story, I’d say it’d be interesting. All this was from the era when the word processor was king, the main application, the virtues of which would lead companies to buy the hardware. In 2001 when I was still living in Paris, I was using…”Windows Me”, but kept pulling my hair out because I needed to do all kinds of work in different languages which required add-on upon add-on. i.e., if I added something for one language, then I needed to add something else to make THAT compatible with Windows Me. Which in turn made it necessary to add yet something else (often at $99 or rather €99 a pop! ), so forth and so on. Fortunately I was visiting some friends in Seattle that holiday season, one of whom was working at Microsoft. It was she who told me about the Office Suite Mac version being superior to the PC version, which helped me make the proverbial Switch as soon as I returned to Paris in 2002. And as I kept telling all and sundry, I only wish I had made the switch much earlier! 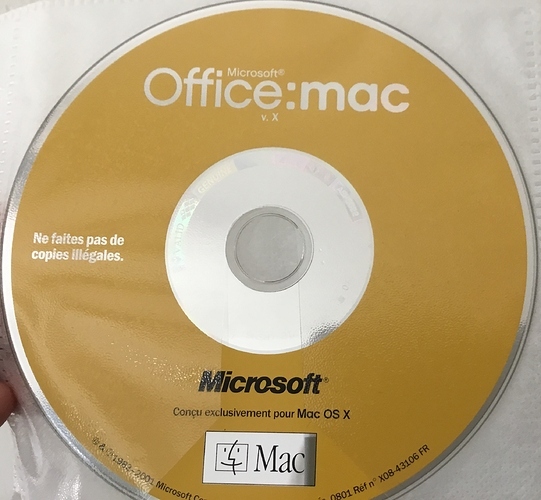 And here’s a photo of the Office Suite for Mac (French version) that I purchased to use with my iMac 4G – which machine I even brought to the US several years ago though I no longer use it, because I consider it a piece of art and am not willing to part with it!